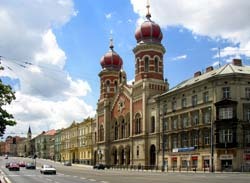 The most recent car booking in Plzen has been made on our website 3893 minutes ago. In Plzen, we offer for rental 4+ car categories from 2+ rental suppliers. OrangeSmile.com combines car offers from absolutely all rental suppliers located in and around Plzen. As an aggregating system, in Czechia we are able to provide reduced rental rates that are, in most of the cases, lower than you can get from the suppliers. The search form above allows you to find these offers in Plzen on any desired period. You can also specify a return location in Czechia different from the pick-up place. The maximum rental period is 30 days. The cars for rent presented in the search results for Plzen are just example models for each specific offer. Unfortunately, for Czechia we are not able to tell in advance which specific car model will be given at the desk. Rare vehicle types, such as convertibles, sports cars, large off-road vehicles or minivans are available in Czechia mostly at airports. If you are looking for such a car type, please check the airports nearest to Plzen. We wish the most exciting discoveries while driving around Plzen! Fans of unusual excursions should definitely visit the Horror Museum located in the heart of the city, on the ground floor of Hotel Central. The museum is housed in ancient dungeons built back in the 16th century. The museum's halls currently display a collection of terrible exhibits that can scare children and adults alike. The very hotel housed in a historic building is famous for its ghosts. Many people visit the museum in the hope of seeing a real ghost here. In the immediate vicinity of the historic district of Plzen, there are Krizik Gardens, which are believed to be one of the city's most beautiful places. The very first garden was planted in this place in the early 19th century. The gardens got their current name in honor of the famous engineer and native of the city František Křižík. The main feature of the gardens is small ponds with carps located in its territory. Local residents claim that if you make a wish and feed the fish bread, it will come true. The most beautiful architectural monument is an old villa with an unusual name of Měšťanská beseda (Eng. - City Talk). The villa built at the beginning of the 20th century is executed in the rare architectural style of Secession. According to the idea of the city authorities, this luxurious villa should have housed a cultural center, accessible to all citizens. Today, the sumptuous building is a popular venue for various cultural events, it often hosts art exhibitions, ceremonies, and symphony orchestra performances. Over the years, the villa has managed to retain some of its rich interior decoration. A few years ago a small cinema, as well as a cozy cafe, were opened in the historic building.